I only have time for one hop today! The lovelies and their boytoys have already started arriving but have headed out to the beach for a bit- so, that gave me a few minutes to tell everyone to HAVE A GREAT WEEKEND! 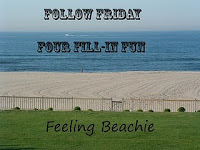 It's time now for Hilary's Follow Friday Four Fill-In at Feeling Beachie! 2. Green tea is my beverage of choice. 3. The last time I got a speeding ticket was two years ago during March Madness. I was on the phone with BestSonInLawEVER (he and I are UNC fans- go Tarheels!) and we were so excited about something that happened and I wasn't paying attention to my speed and was doing 60 in a 35. It was really close to our house and the little cop was so cute. It was his first time stopping someone and he was APOLOGIZING to me! I told him it was totally my fault and we started talking about basketball blahblahblah and he gave me a ridiculously reduced fine. That was only my second speeding ticket EVER. And I HATE that I have had two in my life. I really wanted to go out with NONE. Guess that what I get for driving during March Madness. I will be back online Sunday afternoon! Love and hugs to everyone! YAY! The lovelies are HOME!!! enjoy your time with the family! I think I am up to three years with no speeding tickets... UGH! Good luck on the spanish.. I have enough issues spelling english properly... Thanks for playing along! I´ve had close call´s with the cops (warnings) a few times, but didn´t get a ticket yet. I hope your girls are home by now and you are enjoying their company! Wishing you all a fab weekend! Enjoy your family. I hope your weekend is beautiful and healthy, with much laughter. Green tea = yummy, by the way!